There’s no need to fork out thousands travelling overseas to visit marvellous formations, sights and landmarks…we’ve got them in our very own backyard! 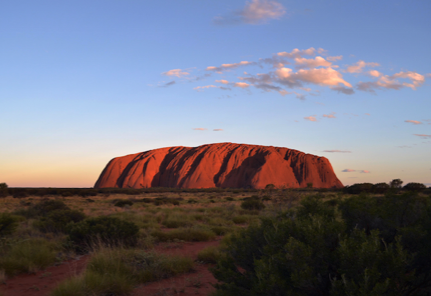 The literal heart of our sunburnt country – the Red Centre – holds the iconic Aussie landmark we call Ayers Rock, which is one of the most incredible landmarks in the world. There’s nothing quite like watching the sun rise or set in the midst of this beautiful natural wonder! Hike, climb and explore Uluru, Kata Tjuta and Kings Canyon on this three-day tour, currently starting from $370 per person! Hosted in private, remote campsites, you’ll sleep out under the stars and enjoy this once-in-a-lifetime, unique Aussie experience. Recently named within the top 5 of Lonely Planet’s ‘top regions you should visit’, The Red Centre’s landmarks really are a bucket list location, so tick it off now for less and make some friends along the way! There’s plenty of walking and hiking to be done, so guests on this tour will need a moderate-to-good level of fitness.